Everything wears out and if you aren’t prepared for it, the situation can become a huge, and costly, disaster. For plumbing pipes, wearing out usually means corrosion and then leaks. We all know the damage that water from leaking pipes can cause: structural damage, property damage, mildew, and the dreaded growth of toxic M-O-L-D. It might seem that a pipe gives way all of a sudden, but the reality is that problems can go unnoticed for a long time, and by the time it is noticed, the damage can be extensive. Most homeowners have their furnace and air conditioner checked every year to get ahead of breakdowns before the heating or cooling seasons begin. Think of the problems you might avoid if you were to have your plumbing system inspected annually. You could really uncover problems from worn out pipes long before a problem is evident. This is especially important for older homes, say older than 50 years or so. That’s because worn out pipes are affecting not just by water and mineral deposits, but also by age. The older your plumbing, the more likely there is corrosion and damage. 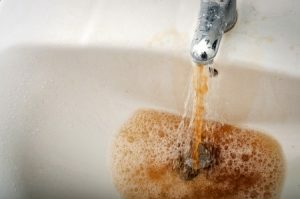 Color of the water – If there is a yellow or brownish tinge to the water from the faucet, especially if you have been gone for a few days, or are using a tap that is not often used, this could be a sign of rust or mineral deposits in the pipes. Lingering drips – It is common for a few drips fall from a faucet or shower head after being shut off, but drips should cease, not continue after 10 or 15 minutes. Even a slow drip is an indication that there is a problem that should be addressed. It’s in your best interest to fix it sooner rather than later. Leaks – Even a small leak could be an indication of more serious problems in the plumbing or of worn out pipes. Generally, the plumbing and pipes in a house are as old as the house, so keep that in mind. You might feel your home is modern, but time passes quickly and all of a sudden you realize your home is no longer new. Pipe changes or corrosion – If you see corrosion, rust, dimpling, or flaking on pipes in your home, it is likely there is corrosion within the pipes as well. Water is not the same in all areas. Some may contain more minerals, more acids, and a variety of other elements that could be corrosive to pipes. If you see anything accumulating on the exterior of a pipe, it could be an indication of deterioration within the pipes, too. Stains and dampness – Water doesn’t just sit on top of surfaces in your home. They are often absorbed and show up as stains on walls, ceilings, and under pipes in cabinets. Stains can be slight and difficult to see, or they can be brown and unsightly. Dampness might become evident by a bubbling up or rough texture appearing, by a musty smell, or by wood warping, buckling, or curling up along the edges. Mildew or mold– Mildew is inevitable in the show, and not necessarily evidence of a plumbing problem. However, the growth of mildew on walls, ceilings, or in cabinets can be a sign of a larger, more substantial, problem. Evidence of a water leak, even if the actual leak is hidden in the wall or under the floor, can also be complicated by mold growth once the wall or floor is opened to uncover the leak. Seeing mold anywhere is an indication there is a problem that should be addressed immediately. More frequent clogs and clogs that are difficult to clear– It is not uncommon for minerals and corrosion to collect and create grooves and ridges that make clogs easier to develop. In addition, clogs that are difficult to clear may be an indication that you might be dealing with worn out pipes. Low water pressure – A buildup of minerals and corrosion in worn out pipes decrease water flow and make the water work much harder at getting through the pipes, wasting pressure. Sometimes water will only dribble out a tap, or not flow at all. This situation can also increase your water bill as you will ultimately use more water in appliances like dishwashers and washing machines, as well as at sinks, in toilets, and in showers. First of all, don’t panic! If you suspect that you are dealing with worn out pipes in your home, give Pipe Dream Plumbing a call and let us complete an inspection. It might not be that you have to replace all the pipes in your plumbing system. It could be that you don’t have worn out pipes, but a tree root in a sewer line, or a main line problem. They key is that Pipe Dream Plumbing professionals can trace the problem and identify it, and provide you with the options that you to fix the problem, no matter what it is. For more than a decade Pipe Dream Plumbing has been solving plumbing problems in the Indianapolis area. Call us at 317-388-1988 to help you keep your pipes flowing and the water where it belongs in your home.